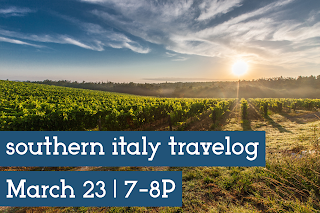 Join us Thursday evening, March 23, from 7 - 8 p.m., for a Southern Italy Travelog. Tour Adriatic fishing towns, the Amalfi Coast, Napoli, Capri, and more with world traveler Ralph Danielsen. See perfect beach resorts, mighty Vesuvius, ancient Greek temples, and igloos built of stone. Registration is required through our online calendar or by phone at 630.529.1641, press 2. Roselle Public Library is located at 40 S. Park Street in Roselle.